Since the beginning of October many western, or vagrant, hummingbirds have been showing up in the east. There have been at least 80 individuals reported or banded in Pennsylvania alone this fall and winter. I have had the opportunity to chase several individuals including Rufous, Anna's, and Allen's Hummingbirds. My first western hummingbird twitch of Fall 2012 came on October 9th. 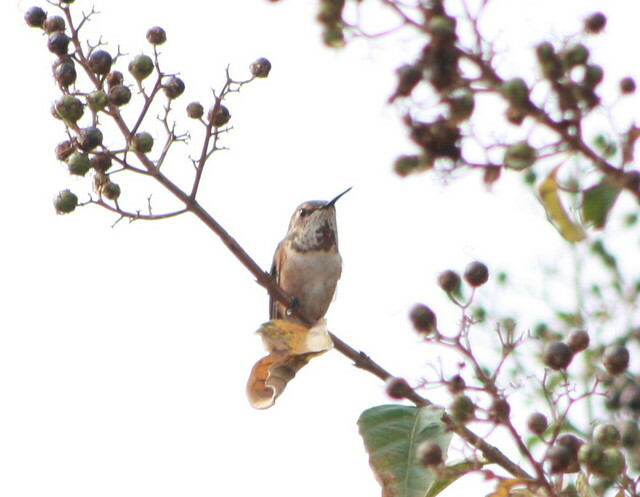 An apparent adult male Rufous Hummingbird was visiting a yard near Camden-Wyoming, Delaware that was first found on October 7th. Rufous Hummingbird in Camden-Wyoming, Delaware on 9 October 2012. Photo by Tim Schreckengost. 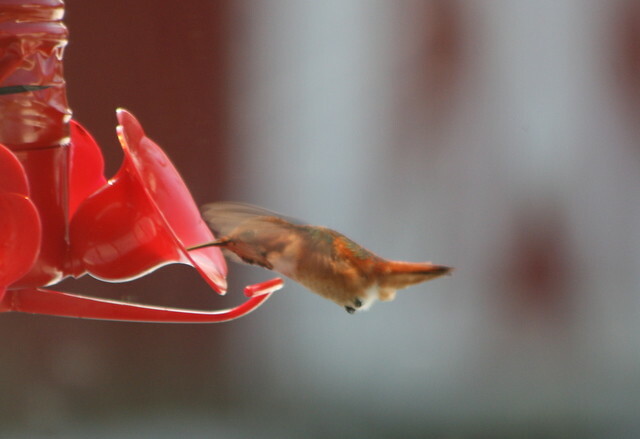 The second western hummingbird came on October 26th in the same yard as the previous bird. 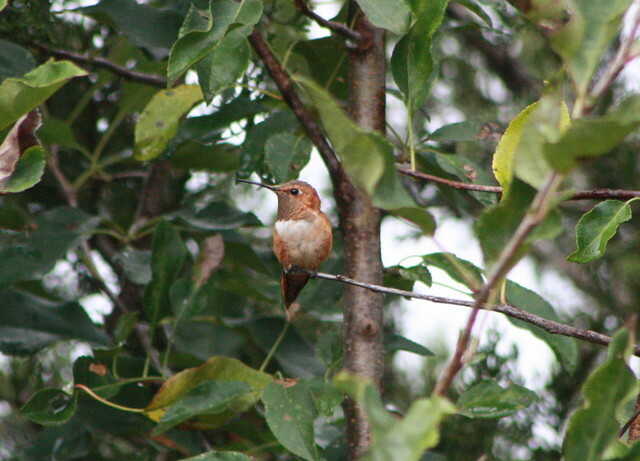 This bird appeared to be a Rufous Hummingbird as well, identified by notched tail feather apparent in this photo. Rufous Hummingbird in Camden-Wyoming, Delaware on 26 October 2012. Photo by Tim Schreckengost. On November 14th, I made my way five minutes down the road, from my house in Newark that is, to observe the first state record of Anna's Hummingbird! This bird was banded as a hatch-year female. Here's a video I took on January 5th, 2013, of the bird (Watch in 480p for best quality). Another species, an Allen's Hummingbird, Pennsylvania's third record, was visiting a feeder in Pipersville. I observed the bird twice now, once on November 22nd and again on January 5th, 2013. The bird was banded as an immature male by Scott Weidensaul and has finally moved on to a more southerly location, hopefully. A video from my first visit can be seen here. Allen's Hummingbird in Pipersville, Pennsylvania on 5 January 2013. Photo by Tim Schreckengost. Finally, I picked up my state Rufous Hummingbird on January 5th, 2013, in Chadds Ford, Pennsylvania. The bird was banded on January 2nd, 2013, by Nick Pulcinella. I'm not sure why it took me so long to see a Rufous Hummingbird in Pennsylvania because the majority of the western hummingbirds banded in the state turn out to be of the rufous variety. Check out more over at Thermal Birding! Crazy, I live in New Mexico and didn't see Rufous Hummingbirds until late this Summer. And I haven't seen an Anna's or Allen's yet. Steve, I've worked several field seasons along the lower Colorado River in Arizona and California and observed many Anna's Hummingbirds and only one Rufous Hummingbird. You should definitely make a trip to some of the birding hotspots in AZ to see these birds, at least Anna's and Rufous. Allen's are relatively hard to come by during migration and the only one I've seen is the one above, which was the third record for Pennsylvania. Cheers! It is a great inspiring video. I am a nature conservation activities for the children of the future. Just remember, when we send you our hummers, you're supposed to send us your warblers. Fair is fair. I'll be sure to do that if I find some over the next few weeks! That's quite a treat to be able to see these normally western hummingbirds in the eastern part of the United States. Very exciting! Wonderful photographs and videos! Thanks, Julie! It sure is pretty awesome!